Hello and welcome to an amazing blog hop! I am joining over 50 other bloggers this week as we spend 5 days blogging on a single topic. My topic is...wait for it.... SEWING! My other crew mates are blogging on everything from freezer cooking to raising a competitive athlete. After reading my post head on over to the crew ship to check out all the amazing topics other moms are blogging about this week. Top stitching is such a nice way to give your skirt a more finished look. It also helps your skirt to lay nicer against your body. First thing you are going to do is turn your skirt over and iron open all your seams. If you have sewn your skirt using a sewing machine, then you are going to need to separate each piece of fabric on the underside of the skirt and use an iron to press them open. I have demonstrated this in the photo above. If you have used a serger, then simply press your serged seam so that it lays nice and flat against one of the fabrics. Repeat this process until all your seams are open and/or flat. Turn your fabric over so the right side is up. Using your sewing machine set on a Zig-Zag stitch, place the seam of your fabric so that it lines up with the middle of your foot. Most standard sewing machine feet have a little mark indicating the middle. Slowly sew a zig zag stitch onto the front of your skirt, right down the middle of the seam, from the top of your skirt to the bottom. Make sure your zig zag stitch is alternating on both fabrics while it stitches. Starting at the top and going nice and slow to the bottom of the fabric. Keeping the seam in the center of the foot means that your top-stitching will be nice and straight. After you have top-stitched all your seam, it is now necessary to sew the skirt together at the open ends. Be sure to make sure your skirt fits (see below!). Place right sides together, pin the open ends together and stitch closed. Press open the seam, then turn the skirt right-side out, and top stitch the remaining seam. 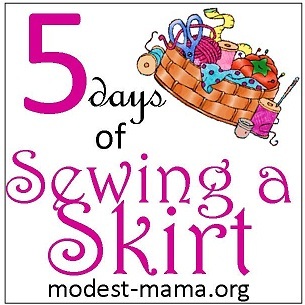 Before sewing your skirt together, you might want to hold it up and make sure it wraps comfortably around you. You don't want it too tight or too loose. This skirt looks best when it hangs freely and has movement. If your skirt is miles too big, remove some panels. If it is too snug, add another panel or two. These changes will be subtle enough that only you will notice them in the finished product. Great job! Now it is time to finish the hem. We are going to be folding the hem up and sewing it closed. Turn your skirt inside-out, grab your ruler, and head over to your iron. Fold the bottom edge of your skirt over 1/2 inch. Press the fold nicely so that the fold holds it's shape. Do this for the entire bottom hem. Once you have the hem folded up 1/2 inch and pressed, you are going to be folding that fold up and pressing. This will keep the raw edge tucked nicely inside the hem. Simply fold over your fold again, and press. Pin this fold as you go to help it hold it's shape. Once you are folded, pressed, and pinned, head back to your sewing machine. With your skirt on the left, line up your pinned hem with your foot. The top of your folded hem should be on the left of your foot. Be sure your machine is set on the straight stitch and you have the needle in the far-left position. Sew around your hem. Going slow means less mistakes. Whew! What a day! Great job on doing the top-stitching and finishing the hem. Only one more day and your skirt will be ready to wear! Curious about what other topics homeschooling moms are spending 5 days on? Don't wait another second to find out! Click here for the other 65 blogging adventures!